Ionizing radiation can not be directly detected with the human senses. So we have developed many ways to detect it. Some devices work best for specific types of sources and purposes. Many dosimeters are now classified as self-reading and/or alarming devices. These instruments allow the user to select early warning and alarms for the amount of exposure that they receive and also to be warned of significantly higher than expected radiation levels. They also have digital read outs for instant access to the exposure monitoring data. These devices can also be linked electronically to a database or software program to maintain records and configure the devices. Radiation detector PM1904 for iPhone. A new type of pocket dosimeter. When preset radiation thresholds are exceeded, device provides LED light alarm. All measurements are recorded in non-volatile memory. Courtesy Polimaster Inc. The popular Luxel dosimeter works using optically stimulated luminescence (OSL) technology. These are widely used by radiologic technologists as well as industrilal workers. The badge contains a sheet of radiation-sensitive aluminum oxide sealed in a light and moisture proof packet. When atoms in the aluminum oxide sheet are exposed to radiation, electrons are trapped in an excited state until irradiated with a specific wavelength of laser light. The released energy of excitation, which is given off as visible light, is measured to determine radiation dose. The packet also contains a series of filters designed so that the energy and type of radiation can be determined. In order for the radiation type and energy to be determined, the dosimeter must be worn so that the front of the dosimeter faces towards the source of radiation. Luxel body dosimeters are among the most sensitive dosimeters available. The minimum detectable dose is 1 millirem for x-rays and gamma rays and 10 millirem for energetic beta radiation. TLDs are often used instead of the film badge. Like a film badge, it is worn for a period of time (usually 3 months or less) and then must be processed to determine the dose received, if any. A TLD contains a phosphor in a solid crystal structure. When a TLD is exposed to ionizing radiation, the radiation interacts with the phosphor crystal. Released light is counted and is proportional to the radiation exposure. Thermoluminescent dosimeters can measure doses as low as 1 millirem, but under routine conditions their low-dose capability is approximately the same as for film badges. The advantages of a TLD over other personnel monitors are its accuracy and its sensitivity to low doses. It is also reusable, which is an advantage over film badges. However, no permanent record or re-readability is provided and an immediate, on the job readout is not possible. Calcium fluoride and lithium fluoride are the two most typical types of TLDs. Calcium fluoride is used to detect gamma exposure. On the other hand, lithium fluoride is utilized for gamma and neutron exposure. TLDs are suitable to be used in different applications. In particular, it can be utilized in environmental monitoring and staff personnel in work areas that involve radiation exposure. Calcium fluoride and lithium fluoride are the two most typical types of TLDs. Calcium fluoride is used to detect gamma exposure. On the other hand, lithium fluoride is utilized for gamma and neutron exposure. TLDs are suitable to be used in different applications. In particular, it can be utilized in environmental monitoring and staff personnel in work areas that involve radiation exposure. Thermoluminescent dosimeters (TLD) are often used instead of the film badge. Like a film badge, it is worn for a period of time (usually 3 months or less) and then must be processed to determine the dose received, if any. A TLD contains a phosphor in a solid crystal structure. When a TLD is exposed to ionizing radiation, the radiation interacts with the phosphor crystal. Released light is counted and is proportional to the radiation exposure. Thermoluminescent dosimeters can measure doses as low as 1 millirem, but under routine conditions their low-dose capability is approximately the same as for film badges. The advantages of a TLD over other personnel monitors are its accuracy and its sensitivity to low doses. It is also reusable, which is an advantage over film badges. 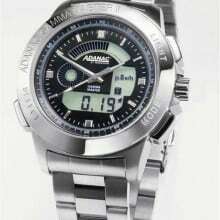 However, no permanent record or re-readability is provided and an immediate, on the job readout is not possible. Anyone who has worked as an X-Ray tech for a long time has used a film badge. 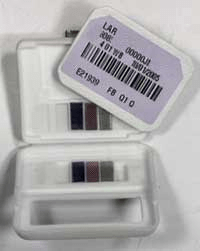 Personnel dosimetry film badges are commonly used to measure and record radiation exposure due to gamma rays, X-rays and beta particles. It is a type of total dose detector. The detector is a piece of radiation sensitive film packaged in a light proof envelope. The film is sensitive to radiation exposure. The film is developed and radiation exposure is measured by the amount of exposure on the film. The major advantages of a film badge as a personnel monitoring device are that it is inexpensive and provides a permanent record. The major disadvantages are that it must be developed and read by a processor (which is time consuming), prolonged heat exposure can affect the film, and exposures of less than 20 millirem of gamma radiation cannot be accurately measured. Film badges need to be worn correctly so that the dose they receive accurately represents the dose the wearer receives. The clip-on badge is worn most often between the collar and waist when performing X-ray radiography. When the film badge is not in use, it should be kept safe in an area which is free of radiation. Moreover, when an overexposure is detected, an investigation is conducted in order to see whether the recorded exposure was accidental or a result of carelessness. Purposeful exposure of the film badge. Failure to use protective shielding. Insufficient or faulty radiation shielding. Wearing the film badge unintentionally while getting diagnostic or therapeutic x-rays. Failure to recognize the questionable film packet as having been used for non-routine recording of radiation exposure. Pocket dosimeters are used to provide the wearer with an immediate reading of his or her exposure to x-rays and gamma rays. The two types commonly used in industrial radiography are the Direct Read Pocket Dosimeter and the Digital Electronic Dosimeter. A direct reading pocket ionization dosimeter is an immediate reading of radiation exposure and is reusable. The limited range, inability to provide a permanent record, and the potential for reading loss due to dropping or bumping are a few of the main disadvantages of a pocket dosimeter. Digital Electronic Dosimeters record dose information and dose rate. These dosimeters most often use Geiger-Müller counters. The output of the radiation detector is collected and, when a predetermined exposure has been reached, the collected charge is discharged to trigger an electronic counter. The counter then displays the accumulated exposure and dose rate in digital form. Some models can also be set to provide a continuous audible signal when a preset exposure has been reached. Scintillators are used by the American government as Homeland Security radiation detectors. Scintillators can also be used in neutron and high energy particle physics experiments, new energy resource exploration, X-ray security, nuclear cameras, computed tomography and gas exploration. Other applications of scintillators include CT scanners and gamma cameras in medical diagnostics, screens in computer monitors, and television sets. Nuclear material can be monitored using certain types of scintillators. Scintillators generate light in fluorescent tubes. The ionization chamber is the simplest of all gas-filled radiation detectors, and is widely used for the detection and measurement of certain types of ionizing radiation; X-rays, gamma rays and beta particles. Ion chambers have a good uniform response to radiation over a wide range of energies and are the preferred means of measuring high levels of gamma radiation. They are widely used in the nuclear power industry, research labs, radiography and other medical radiation fields, and in environmental monitoring. A proportional counter uses a combination of the mechanisms of a Geiger-Muller tube and an ionization chamber. 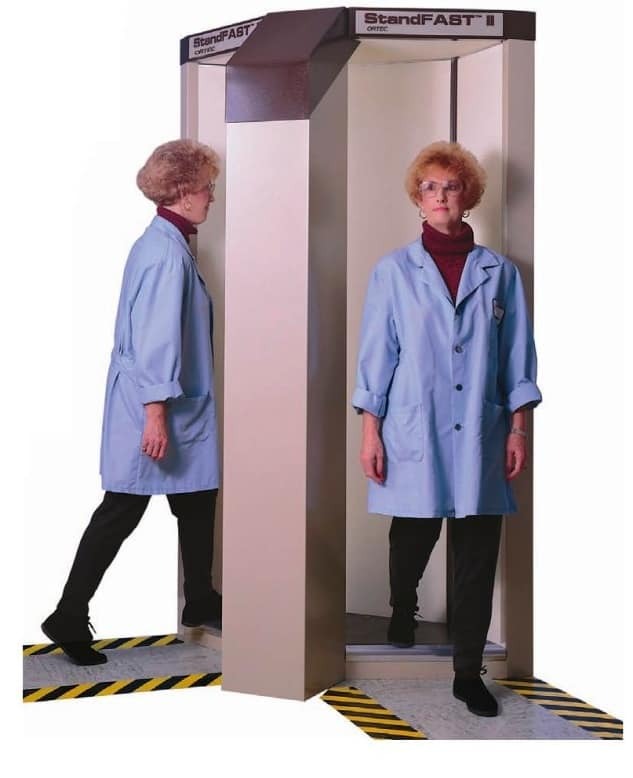 Proportional counters are used extensively as large area detectors to check for radioactive contamination on personnel, tools and items of clothing. This is normally in the form of installed instruments because of the difficulties of providing portable gas supplies for hand-held devices. In this particular application they are flat-chambered multi-wire detectors for alpha and beta detection. They have a large area detection window made from such as metallized mylar to form part of the cathode, and an anode wire routed in a convoluted manner to intersperse fully within the gas fill area of the detector. These detectors are able to discriminate between alpha and beta radiation. Also called a Geiger–Müller counter, this is a type of particle detector that measures ionizing radiation. 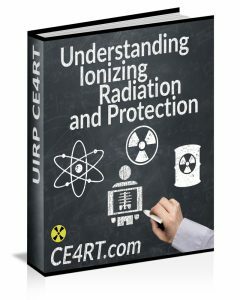 Ionizing radiation is invisible and not directly detectable by human senses, so instruments such as Geiger counters are usually required to detect its presence. They detect the emission of nuclear radiation: alpha particles, beta particles or gamma rays. A Geiger counter detects radiation by ionization produced in a low-pressure gas in a Geiger–Müller tube. Each particle detected produces a pulse of current, but the Geiger counter cannot distinguish the energy of the source particles. Invented in 1908, Geiger counters remain popular instruments used for measurements in health, physics, industry, geology and other fields, because they can be made with simple electronic circuits. 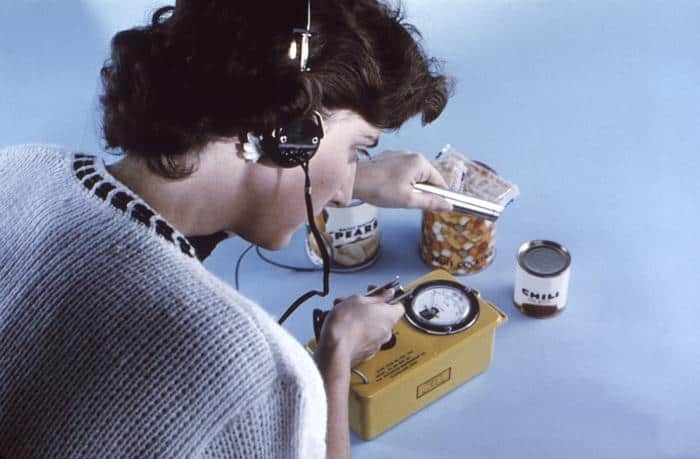 This 1963 image depicted a Centers for Disease Control staff member, as she was surveying foods for fallout contaimination with a Geiger-Müller counter. 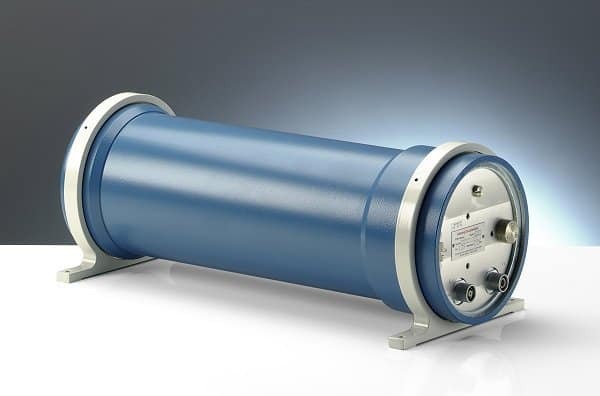 The Geiger-Müller counter, usually referred to as a Geiger counter, is a particle detector that checks for the presence of of ionizing radiation, including the emission of nuclear radiation. Radioactive decay may give rise to gamma radiation which cannot escape the body due to being absorbed or other interaction whereby it can lose energy; so account must be taken of this in any measurement analysis. There are many ways a person can be positioned for this measurement: sitting, lying, standing. The detectors can be single or multiple and can either be stationary or moving. The advantages of whole body counting are that it measures body contents directly, does not rely on indirect methods (such as urinalysis) and that it can measure insoluble radionuclides in the lungs.On the other hand, disadvantages of whole body counting are that it can only be used for gamma emitters, except in special circumstances, and it can misinterpret external contamination as an internal contamination. On its own, it may be unable to distinguish between radioisotopes that have similar gamma energies. Alpha and beta radiation is largely shielded by the body and will not be detected externally, but the coincident gamma from alpha decay may be detected, as well as radiation from the parent or daughter nuclides. Any radiation detector is a relative instrument, that is to say the measurement value can only be converted to an amount of material present by comparing the response signal (usually counts per minute, or per second) to the signal obtained from a standard whose quantity (activity) is well known. A whole body counter is calibrated with a device known as a “phantom” containing a known distribution and known activity of radioactive material. The accepted industry standard is the Bottle Manikin Absorber phantom (BOMAB). The BOMAB phantom consists of 10 high density polyethylene containers and is used to calibrate in vivo counting systems that are designed to measure the radionuclides that emit high energy photons (200 keV < E < 3 MeV). Because many different types of phantoms had been used to calibrate in vivo counting systems, the importance of establishing standard specifications for phantoms was emphasized at the 1990 international meeting of in vivo counting professionals held at the National Institute of Standards and Technology (NIST) (Kramer and Inn 1991). The consensus of the meeting attendees was that standard specifications were needed for the BOMAB phantom. The standard specifications for the BOMAB phantom provide the basis for a consistent phantom design for calibrating in vivo measurement systems. Such systems are designed to measure radionuclides that emit high-energy photons and that are assumed to be homogeneously distributed in the body. A well designed counting system can detect levels of most gamma emitters (>200 keV) at levels far below that which would cause adverse health effects in people. A typical detection limit for radioactive cesium (Cs-137) is about 40 Bq. The Annual Limit on Intake (i.e., the amount that would give a person a dose equal to the worker limit that is 20 mSv) is about 2,000,000 Bq. The amount of naturally occurring radioactive potassium, present in all humans and clearly not harmful as we’ve all got it, is also easily detectable. The reason that these instruments are so sensitive is that they are often housed in low background counting chambers. Typically this is a small room with very thick walls made of low-background steel (~20 cm) and perhaps lined with a thin layer of lead (~1 cm). The background reduction inside the chamber will be several orders of magnitude. Some counters use low background steel for shielding such as armor plating from warships built in the pre-nuclear era. Depending on the counting geometry of the system, count times can be from 1 minute to about 30 minutes. The sensitivity of a counter does depend on counting time so the longer the count, for the same system, the better the detection limit. 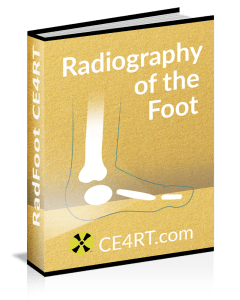 Cytogenic Biodosimetry uses the human body’s response to radiation as the basis for accurately estimating the radiation dose. When the energy associated with ionizing forms of radiation is transferred to atoms and molecules in human cells and tissues, the chromosomal DNA is damaged in proportion to the type and amount of energy that is absorbed. Chromosomal abnormalities can be induced by a radiation exposure. The number of abnormalities is quantified and compared to a known calibration curve in order to derive a dose estimate. This strategy for dose estimation is valid because lymphocytes express the damage regardless of whether they are in or out of the body at the time of exposure. When the energy associated with ionizing forms of radiation is transferred to atoms and molecules in human cells and tissues, the chromosomal DNA is damaged in proportion to the type and amount of energy that is absorbed. Cytogenetic biodosimetry uses human peripheral blood lymphocytes (HPBLs). Chromosomal abnormalities, such as dicentrics, can be induced by a radiation exposure. The number of dicentrics is quantified and compared to a known calibration curve in order to derive a dose estimate. This strategy for dose estimation is valid because lymphocytes express the damage regardless of whether they are in or out of the body at the time of exposure. Small volumes (less than 10 mL) of peripheral blood are obtained by phlebotomy from exposed subjects as soon as practical (generally 1 day after exposure) and sent to a cytogenetic biodosimetry laboratory for dose assessment. The laboratory processes samples according to its established protocols. Cytogenetic damage is then assessed by experts and dose assessment is made by comparison with an appropriate calibration curve, taking into consideration radiation type, dose rate, whole- or partial-body exposures, delay between samplings, and specific cytogenetic assessment. When available, cytogenetic analysis can complement physical dosimetry by confirming or ruling out a radiological exposure. When physical dosimetry is unavailable, cytogenetic analysis is often the only available dose estimation method. It has been used in response to several radiation accidents, such as that at Chernobyl (Ukraine), Goiânia (Brazil), and Tokaimura (Japan), for dose assessment, as well to resolve suspected occupational overexposures. The Baby Tooth Survey was initiated by the Greater St. Louis Citizens’ Committee for Nuclear Information in conjunction with Saint Louis University and the Washington University School of Dental Medicine as a means of determining the effects of nuclear fallout in the human anatomy by examining the levels of radioactive material absorbed into the deciduous teeth of children. The research focused on detecting the presence of strontium-90, a cancer-causing radioactive isotope created by the more than 400 atomic tests conducted above ground that is absorbed from water and dairy products into the bones and teeth given its chemical similarity to calcium. The team sent collection forms to schools in the St. Louis, Missouri area, hoping to gather 50,000 teeth each year. Ultimately, the project collected over 300,000 teeth from children of various ages before the project was ended in 1970. Preliminary results published by the team in the November 24, 1961, edition of the journal Science showed that levels of strontium 90 in children had risen steadily in children born in the 1950s, with those born later showing the most increased levels. The results of a more comprehensive study of the elements found in the teeth collected showed that children born after 1963 had levels of strontium 90 in their baby teeth that was 50 times higher than that found in children born before the advent of large-scale atomic testing. The findings helped convince U.S. President John F. Kennedy to sign the Partial Nuclear Test Ban Treaty with the United Kingdom and Soviet Union, which ended the above-ground nuclear weapons testing that placed the greatest amounts of nuclear fallout into the atmosphere. The Baby Tooth Survey inspired a number of similar initiatives in other parts of the world. For example, what became known as the Tooth Fairy Project was developed in South Africa in order to determine whether human health impacts arising from radioactivity and heavy metal pollution downstream from gold mining activities, driven by acid mine drainage, was occurring. 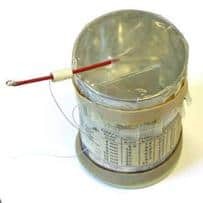 A KFM is a radiation meter anyone can make with cheap materials at home. It is possible to construct a Kearny Fallout Meter from plans with just a coffee can or pail, gypsum board, monofilament fishing line, and aluminum foil. It also is a science project demonstrating the effect of ionizing radiation. An electrostatic charge is placed upon two aluminum foil leaves. Basically, it’s a can containing the two pieces of foil. As the air inside the can gets charged, the pieces of foil take on charge, as they will contain the same positive or negative charge, they will repel each other. The level is determined by measuring the amount of repulsion. Detailed plans can be found at http://www.cddc.vt.edu/host/atomic/pdf/kfm_inst.pdf . Cresson Kearny developed the Kearny Fallout Meter from research done at Oak Ridge National Laboratory. His research was also published in the civil defense manual Nuclear War Survival Skills.